Radiohead? I had nearly forgotten about the band, were it not that that is an impossibility. People always refer to the band, they are on the radio, mostly with 'O.K. Computer' and before. If I'm honest I can't remember when listening to one of its records last and certainly can not remember a single song of its last album 'The King Of Limbs'. Have I reviewed it? If I have, it was in the paper version of WoNo Magazine. So, did I look forward to A Moon Shaped Pool? Not particularly. Curious? Yes, of course. Radiohead remains Radiohead. I have no problem admitting right up that from the very first songs I was intrigued. I am three songs into the album, for the first time when opening this review. Already my ears had to digest a lot, including the typical Radiohead sound created by the characteristic way of singing of Thom Yorke, who does everything but make sure that I know what he's singing about. What is amazing about Radiohead is that the band evolved so much over the years. From the grunge type 'Creep' to one of the most experimental, highly respected, bands on the planet; with all band members on board. All have found new roles in the experiments that go far beyond the instruments they played when they started Radiohead. No one felt (or at least, looking in from the outside, seemed to feel) disgruntled, jealous nor hated the direction the band took. That is fairly exceptional with such big changes. 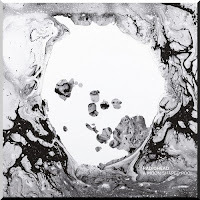 A Moon Shaped Pool is an album that, in 2016, delivers what the world expects from Radiohead. In that sense the band has become predictable. Are there new ways to turn into left? Perhaps not. Continuing without compromises is the route that is open and that is route the band takes. I have found some developments, at least for me that is and allowing for what I wrote above: it's been some years. ...once I allow myself to really listen to A Moon Shaped Pool it is hard not to stand in awe of what Radiohead presents. The album holds a high level of quality music and all the praise I have encountered is well deserved. Radiohead may not be as big as U2 is/was, but it manages to do what U2 did after its first three albums. Raise the bar with each album for over ten years. What it seems like is that Radiohead manages to do so for a longer period of time. Just take a song like 'Glass Eyes'. With a near classical accompaniment, Radiohead profits from Jonny Greenwood's film score outings and classical training. Over a piano basis a string section plays a classical arrangement over a typical Radiohead song. The contrast with the electric rhythms elsewhere on the album is huge. The same goes for the song with all that novel titles stacked behind each other. So something new and allowing for feelings through organic instruments. It brings me to a conclusion that I've never realised before. Radiohead is the inheritor of the The Beatles' legacy. Just think about it and you might come to see what I mean. Overhearing it all A Moon Shaped Pool leaves me quite in awe, though slightly chilly. I just can't really warm to the music on offer. At the same time Radiohead has me where it wants me to be. And that has been a while since that happened. It may well be that you will find this album in my top 10 of 2016. 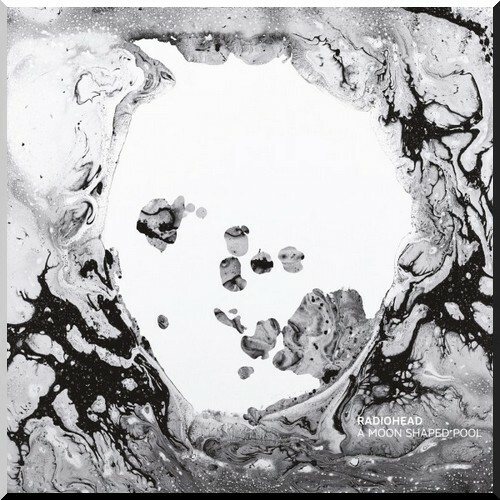 At this point in time I think this is Radiohead's best album since that giant breakthrough one, as everything seems to be coming together for them in 2016.